The ADR gives you the best of both worlds. You can sit part of the day, as you always have, but you can also stand and take advantage of all the health benefits that come with standing and moving around. You, and your associates, will become healthier and more productive. Your ADR uses your current desk…….no need to buy all new furniture. You can sit as you always do and then easily raise the large 32" x 20.5" desk and keyboard tray into 5 additional raised positions (up to 16.3" above your regular desk). The large surface can hold 2 monitors or a monitor and a laptop. The ADR is the only Adjustable Desk Riser that offers a retractable keyboard tray. 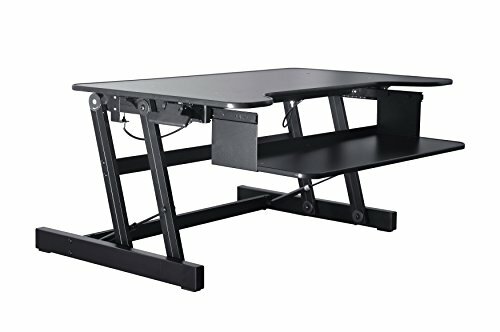 The tray allows you to get into the most comfortable position and it is large enough to hold a laptop computer (with other risers you may have to move the laptop or the entire riser every time you change from sitting to standing). The ADR uses gas springs and can easily raise and lower up to 30 lbs. with a maximum wight allowance of 50lbs. It arrives completely assembled and ready to go! NO ASSEMBLY REQUIRED: Comes ready to use out of the box, ADR weighs 26.7 lbs. If you have any questions about this product by Rocelco, contact us by completing and submitting the form below. If you are looking for a specif part number, please include it with your message.